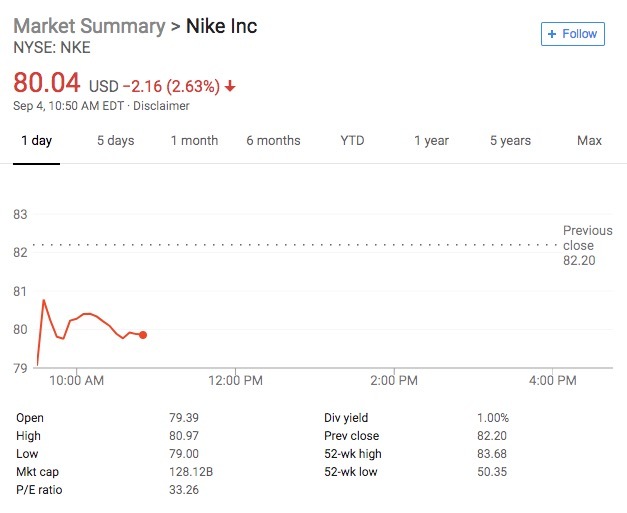 Nike stock was down 2.75 percent Tuesday morning after the company announced former NFL quarterback Colin Kaepernick as the new face of its “Just Do It” campaign. The promotion of the former athlete, who protested racial injustice by kneeling during the national anthem, has led to major backlash against the sports company. A boycott was started and people began posting videos of themselves burning their Nike gear. The kneeling protest spread throughout many teams in the league, and in 2017 President Donald Trump called for NFL players who kneel to be fired. The NFL has since passed new rules against protesting the anthem.